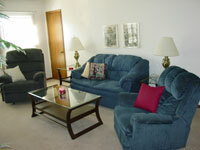 Located in a very quiet residential setting, the Parkside Apartments community is a welcome home to 50 families. 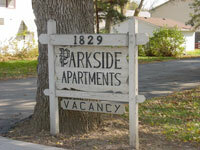 Parkside Apartments offers traditional, furnished, and corporate apartments in a roomy two-bedroom configuration. The grounds feature many trees as well as a gazebo and are adjacent to Blair Nebraska's beautiful rose gardens. A convenient location in Blair, Nebraska, the Parkside Apartments are within walking distance of South School, a swimming pool, a city park, and shopping. Get the benefits of Omaha while living in a small town - we are only 20 minutes outside of Omaha!